NASA’s Lunar Reconnaissance Orbiter (LRO) spacecraft has returned data that indicate ice may make up as much as 22 percent of the surface material in a crater located on the moon’s south pole. 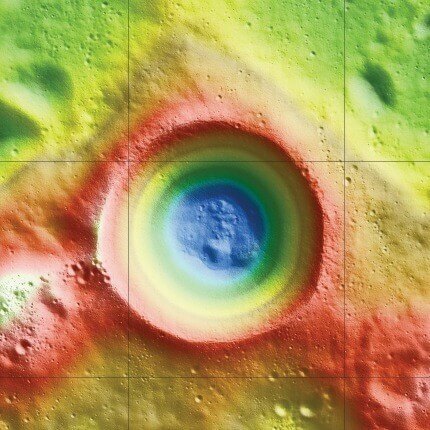 The spacecraft mapped Shackleton crater with unprecedented detail, using a laser to illuminate the crater’s interior and measure its albedo or natural reflectance. The laser light measures to a depth comparable to its wavelength, or about a micron. That represents a millionth of a meter, or less than one ten-thousandth of an inch. The team also used the instrument to map the relief of the crater’s terrain based on the time it took for laser light to bounce back from the moon’s surface. The longer it took, the lower the terrain’s elevation. The crater, named after the Antarctic explorer Ernest Shackleton, is two miles deep and more than 12 miles wide. Like several craters at the moon’s south pole, the small tilt of the lunar spin axis means Shackleton crater’s interior is permanently dark and therefore extremely cold. The initial primary objective of LRO was to conduct investigations that prepare for future lunar exploration. Launched in June 2009, LRO completed its primary exploration mission and is now in its primary science mission. LRO was built and is managed by Goddard. This research was supported by NASA’s Human Exploration and Operations Mission Directorate and Science Mission Directorate at the agency’s headquarters in Washington.